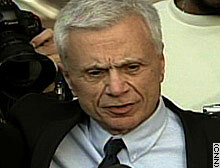 Robert Blake speaks to the media Wednesday after the verdict. LOS ANGELES, California (CNN) -- Four years of a real-life crime story ended Wednesday for actor Robert Blake, the star of "In Cold Blood" and "Baretta," when a California jury acquitted him of murder in the 2001 slaying of his wife. Blake, 71, met the verdicts with sobs and embraced his lawyer after the announcement, which followed more than a week of deliberations. "I never lost hope," Blake told reporters after the verdict. "If you live to be a million, you will never ever in your life meet anyone more blessed than me," he said. Blake was charged with one count of murder with a special circumstance of lying in wait and two counts of solicitation of murder in the shooting death of Bonny Lee Bakley, 44. He would have faced a sentence of life in prison if convicted. Jurors acquitted him of the murder count as well as one count of solicitation of murder. They deadlocked on a second solicitation count, with the vote 11-1 in favor of a not-guilty verdict. Superior Court Judge Darlene Schempp dismissed the remaining count, saying a retrial on that count "would not result in anything different." In the moments before the verdict, Blake sat at the defense table, almost with a scowl on his face. When the not guilty verdict was read, he smiled, leaned over and hugged his attorney. He then placed his head on the table and sobbed. At one point, he nearly collapsed; hands shaking, he fumbled with a bottle of water his lawyer gave him. More than an hour later, smiling and smoking a cigarette, Blake emerged from the courthouse and proceeded to blast friends, associates and relatives who had criticized him in interviews as "liars" and "commode scum" in a combative, sometimes profane news conference. He praised "this small band of dedicated lawyers" who "saved my life," but complained that the proceedings had left him "broke." "If you want to know how to go through $10 million in five years, ask me," he said. CNN legal analyst Jeffrey Toobin said he was "pretty surprised" by the verdict. "It sure seemed like he was the only person with the opportunity, the motive and the means to kill [Bakley]," Toobin said. "But there was no eyewitness. There was no murder weapon established," he said. "The jury didn't buy it, and the jury didn't buy the whole prosecution's case." Later, juror Lorie Moore told reporters the prosecution did not prove Blake committed the crimes. "We just didn't have enough evidence to say whether he did or if he didn't," she said. Jury foreman Thomas Nicholson said prosecutors "couldn't put the gun in his hand" with evidence of gunshot residue or blood on Blake's clothing. Jurors considered the circumstantial evidence against Blake "flimsy" and discounted the testimony of two key prosecution witnesses, he said. "They could never connect all the links in the chain," Nicholson said. Prosecutors argued Blake tried and failed to hire two Hollywood stuntmen, Gary McLarty and Ronald Hambleton, to kill Bakley. But Blake's attorneys argued that Los Angeles police rushed to judgment against Blake, and the defense team attacked the stuntmen as habitual liars and drug addicts. "McLarty's testimony, in my view, was so disjointed and so irregular in everything he said and tried to say, it had no bearing at all in terms of the case," Nicholson said. He dismissed Hambleton as a "prolific liar." Sandi Gibbons, a spokeswoman for the Los Angeles County district attorney, said prosecutors and police believed they had a "solid circumstantial case" against Blake. "We believe the evidence was compelling," she said. "We presented the evidence to the jury fully, honestly and professionally. Unfortunately, these jurors disagreed with our view of the evidence." Bakley was shot to death May 4, 2001, outside Blake's favorite Italian restaurant in Studio City, after the two had dinner. Blake had said he left Bakley in the car while he returned to the restaurant to retrieve a handgun he had left behind. He told detectives he was armed because his wife feared someone was stalking her. Born Michael Gubitosi, Blake got his start in the "Our Gang" comedies of the 1930s and '40s, made his mark as an adult in films like "In Cold Blood" and "Tell Them Willie Boy is Here," and starred in the 1970s detective show "Baretta." Prosecutors said Blake felt Bakley had tricked him into marriage after she became pregnant with his child -- and that he hated her so much he would do anything to keep her away from the girl, Rosie, who was 3 months old at the time of the killing. He married Bakley in November 2000, after DNA tests indicated he was the father of the daughter Bakley gave birth to that June. They lived separately, and Bakley stayed in a bungalow behind Blake's four-bedroom house in Studio City. Bakley initially claimed the child was fathered by either Blake or Christian Brando, son of actor Marlon Brando. "This really was a story out of a bad novel," Toobin said. Blake attorney Gerald Schwartzbach said his client handled the trial with "tremendous grace." "He handled the deliberations with more composure than I was able to muster," Schwartzbach said. Schwartzbach was Blake's fourth lawyer. Two others -- Harland Braun and Jennifer Keller -- quit over Blake's insistence on doing television interviews while awaiting trial. A third, Thomas Mesereau Jr., was dismissed after citing "irreconcilable differences" with his client. Mesereau now represents embattled pop star Michael Jackson. Blake spent nearly a year in jail before being allowed to post bond. "This case just dragged on and on," Toobin said. "The key moment in the case was when Robert Blake was released on bail" -- in March 2003. "Mesereau got him out on bail," Toobin said. "Now it looks like he's never going back in." After the verdict, he said he needed to find a job but would first go "cowboying." "Cowboying is when you get in a motor home or a van and you just let the air blow in your hair," he said. "And you wind up in some little bar in Arizona someplace, and you shoot a game of one-hand nine-ball with some 90-year-old Portuguese woman that beats the hell out of you. "And you just roam around and get some revitalization, that there are human beings in the world, that there are people living their lives that have no agenda."